Step through a gleaming entryway into a soaring Midtown East luxury hotel lobby steeped in grand tradition, highlighted with art deco lamps and a backlit onyx ceiling. 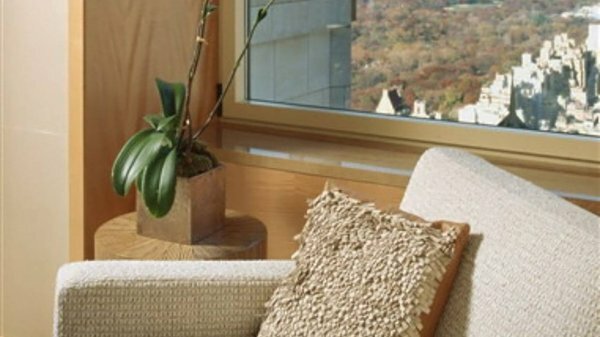 After experiencing the exhilarating whirlwind that is New York City, return to the serenity of Four Seasons and its spectacular views of Central Park. 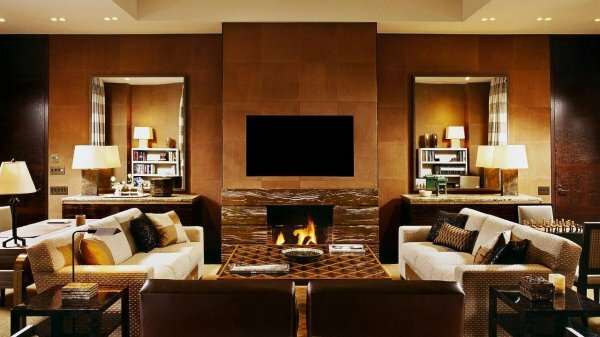 Befitting the city it’s in, Four Seasons Hotel New York in Midtown Manhattan is a luxury five-star hotel that towers 52 storeys tall. Inside this beacon of sophistication designed by I.M. Pei, you’ll find 368 generously sized Midtown East hotel rooms and luxury suites, as well as an attentive yet unobtrusive staff. Four Seasons New York signature therapeutic massage blends four relaxing massage modalities – shiatsu, Thai stretching, Swedish massage and reflexology – for the ultimate in relaxation at our Midtown Manhattan luxury spa. Note: Earlier or later treatments can be arranged in your guest room or suite, for an additional charge. 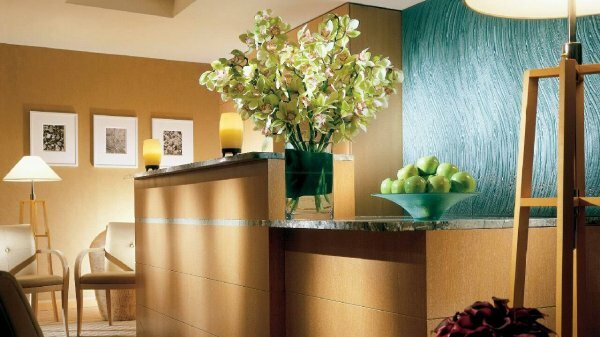 Stay healthy and rejuvenate at Four Seasons Hotel New York by visiting our Fitness Centre and Spa. Try our flexibility and strength-training programmes, or enjoy a rejuvenating workout in Central Park. Or simply relax in the whirlpool, sauna or steam room. State-of-the-art exercise machines are also available for workout routines. Note: The fitness area is accessible 24 hours a day with the use of a room key. Visit our Business Centre for around-the-clock access to internet, printing and faxing capabilities. Business Centre is closed on selected holidays. At Four Seasons Hotel New York, you’ll find a wonderful base for your family. With a staff that makes your young ones feel right at home, and a resourceful Concierge always close at hand to help in any way. With 48 hours notice, we can arrange reliable babysitting services for your little ones. We only refer experienced, bonded and insured babysitters. Please note that there is an hourly fee for this service. Attack the city with children in tow and an itinerary of kid-friendly attractions, both new and old, provided by our Concierge. Precious memories start here. 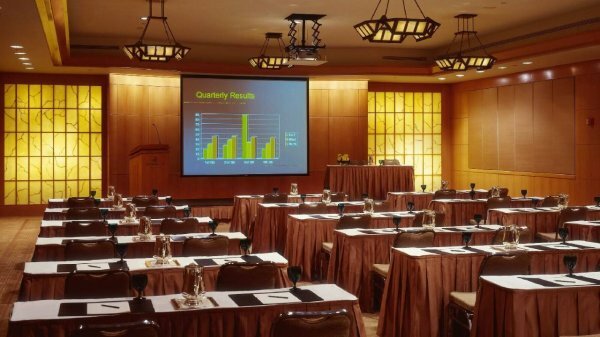 Set the agenda for success at the quintessential Manhattan address, between Park and Madison Avenues, with ultra-chic, ultra-tech meeting spaces and award-winning service that never sleeps. Inside New York’s tallest five-star luxury hotel are 368 ultra-spacious Midtown East hotel rooms and luxury suites off Park Avenue. Many feature dazzling Central Park views, while others present the city’s iconic skyline. 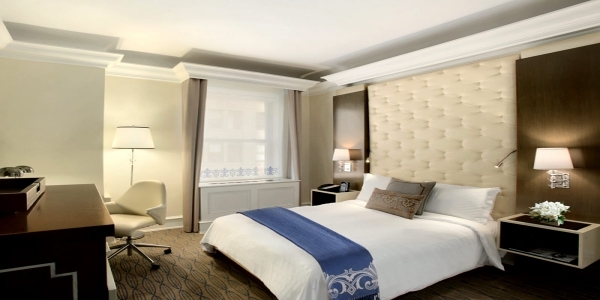 A few of our Mahattan hotel rooms and suites even offer both. 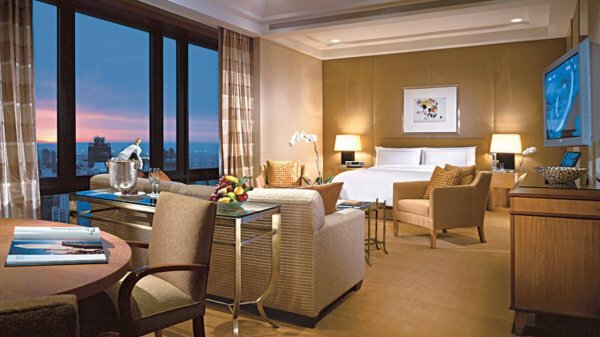 Whether you stay in a Deluxe Room or opt for a Presidential Suite, you’ll enjoy the delightful touches they all share, such as handcrafted furniture, a full marble bathroom and bedside controls that open your drapes at a touch of a button to reveal the dynamic, world-class city spread out before you. Living and working areas in the Terrace Park-View Executive Suite are separated from the sleeping quarters by solid wood doors, while the furnished terrace provides magnificent views of Central Park. BATHROOMS	:The marble bathroom has a deep soaking tub, glass-enclosed shower and TV. Living and working areas in the Premium Park-View Executive Suites are separated from the sleeping quarters by solid wood doors. 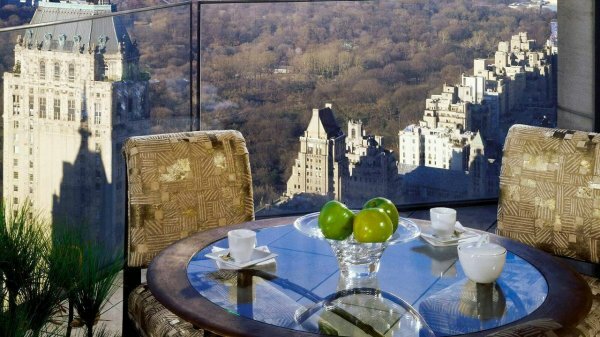 These suites offer a magnificent view of Central Park from the Hotel’s highest floors. BATHROOMS	:The marble bathroom has a glass-enclosed shower stall, deep-size tub, TV and a foyer changing area. Living and working areas in the Park-View Executive Suites are separated from the sleeping quarters by solid wood doors. 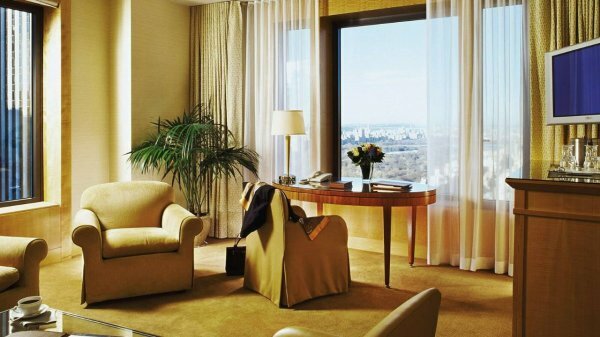 These suites offer a magnificent view of Central Park from the Hotel’s upper floors. Living and working areas in the City-View Executive Suites are separated from the sleeping quarters by solid wood doors, ensuring privacy for informal meetings or entertaining. 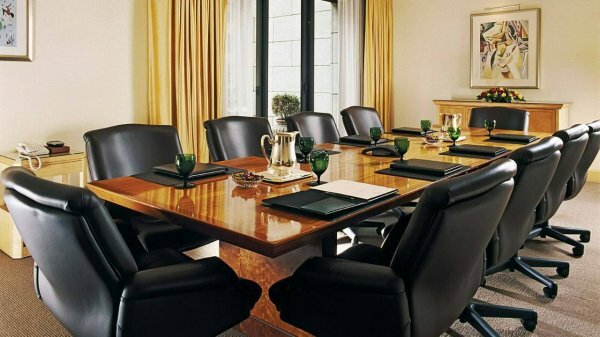 Ideal for guests conducting business, these suites feature custom details and a magnificent view of the city from the Hotel’s upper floors. 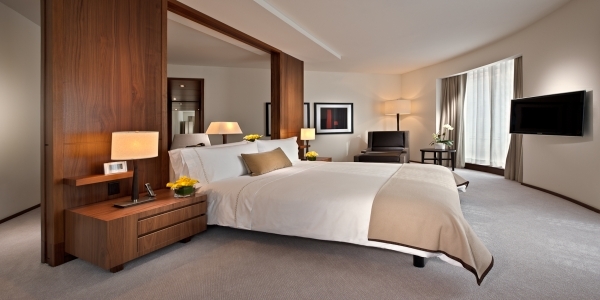 A tranquil haven in the city, Panoramic Park-View Tower Rooms feature striking views of Central Park. Located on the 31st to 50th floor, the Panoramic City-View Tower Rooms allow you to tap into the vibrant pulse of the city through enticing views of the glittering skyline. Spacious and inviting, Grand City-View Rooms, located on the 16th to 25th floor, feature oversized windows that frame the vibrant, glittering cityscape. Spacious and inviting, Premium City-View Rooms, located on the 26th to 29th floor, feature oversized windows that frame the vibrant, glittering cityscape. Take in vibrant city views from your own private terrace. 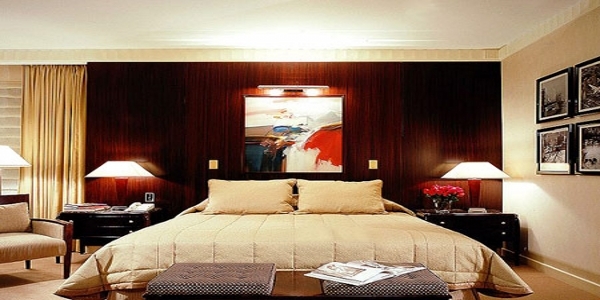 Terrace Deluxe Rooms are located on the 5th to the 19th floor. Generously sized at 600 square feet (56 square metres), City-View Deluxe Rooms offer spacious sophistication and a king bed, two double beds or two twin beds. 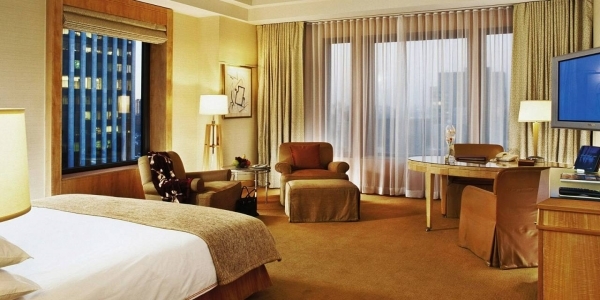 Located on the 6th to the 22nd floor, City-View Rooms feature large windows that frame the exciting cityscape. 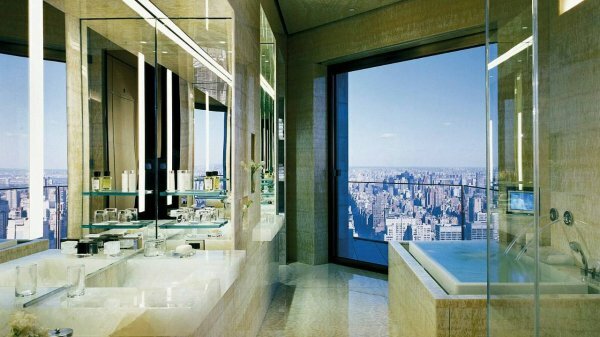 BATHROOMS	:Marble bathroom includes a glass-enclosed shower and a spacious en suite changing area; many City-View Rooms also offer a deep soaking tub. 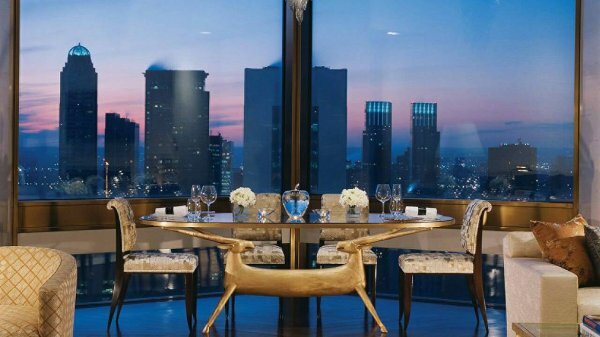 The highest hotel suite in a city known for its legendary skyscrapers, the opulent, one-of-a-kind Ty Warner Penthouse soars 800 feet (244 metres) above the street. Created by visionary architects I. M. Pei and Peter Marino, the suite was seven years and USD 50 million in the making and offers incredible 360-degree views. 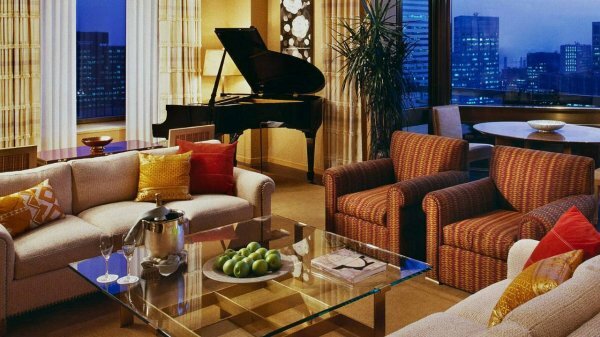 Our two Presidential Suites offer glorious views from floor-to-ceiling bay windows and furnished balconies. The Royal Three-Bedroom Suite’s classic, elegant interior reflects a residential feel and gives the sense of visiting a luxurious, private Manhattan apartment. Facing south, Premium Manhattan One-Bedroom Suites look out from the 40th to 49th floor. They offer premium views of downtown Manhattan and landmarks such as the Empire State Building and the Chrysler Building. BATHROOMS	:The marble bathroom with glass-enclosed shower stall, deep soaking tub, TV and two sinks; a separate guest powder room is tucked away near the living room. Facing south, Manhattan One-Bedroom Suites look out from the 33rd to 39th floor. 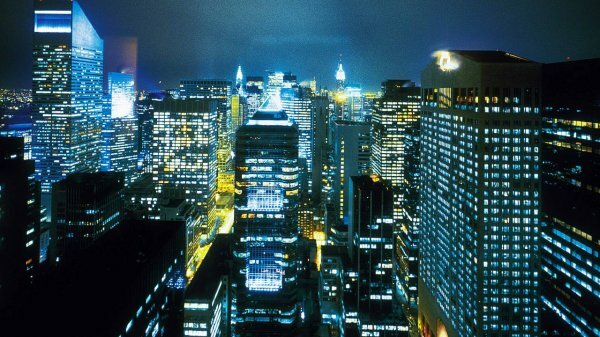 They offer full views of downtown Manhattan and landmarks such as the Empire State Building and the Chrysler Building. Floor-to-ceiling windows and two terraces overlook Central Park or the Manhattan skyline. 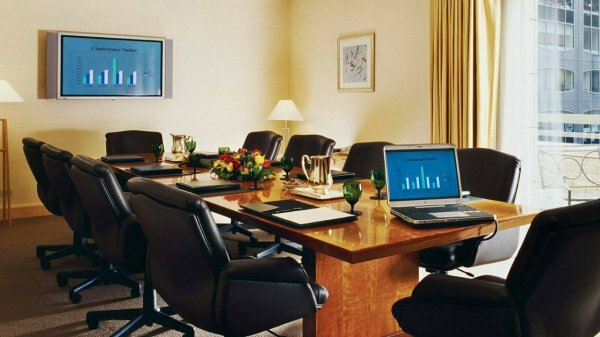 A private office area boasts the latest in communications technology. Experience some of New York’s most acclaimed fine dining and drinks experiences in Manhattan’s Midtown East: from the premium Italian caviar and fine drinks selection at the 1930s Art Deco-inspired Calvisius Caviar Lounge to warmly sophisticated light fare in the inviting TY Lounge to the acacia trees and indoor forest-like setting of The Garden restaurant. End your day – or start your evening – with an expertly mixed martini, house-infused vodka or single malt at The Bar. 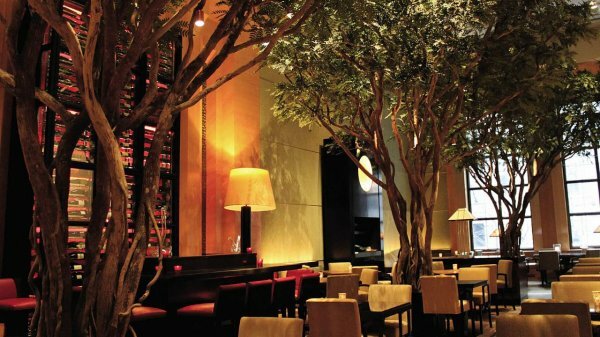 Overlooking the Hotel’s towering Grand Lobby, The Garden provides a dramatic, enchanted forest-like restaurant setting in New York. Take a table in between the twisting, undulating trunks of enormous African acacia trees. The Garden offers breakfast, lunch, and weekend brunch with exceptional restaurant menus featuring local ingredients, and is now open for dinner on weekdays. 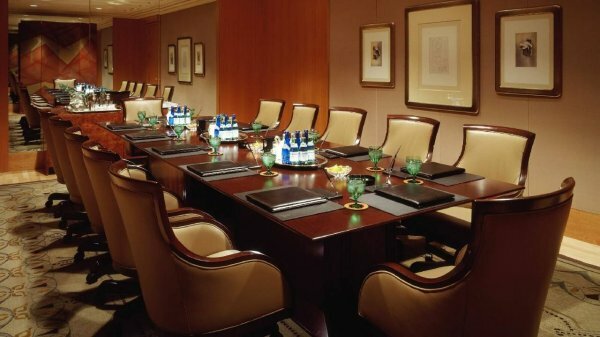 On Saturday and Sunday evenings, it is turned into an event space perfect for intimate gatherings in Midtown Manhattan. Try the lemon ricotta hotcake for breakfast, or the seared ahi tuna burger for lunch. Beginning Thursday, September 13, The Garden Restaurant will be open for dinner Monday to Friday from 5:30 pm to 9:30 pm. One of New York’s most desirable destinations after work, The Bar welcomes – with lofty ceilings, gentle lighting and fascinating people. Relish an extensive menu of impeccably mixed martinis, as you try to narrow down your choice from our assortment of delectable light fare such as Kobe beef sliders and tuna sashimi. Now while Martinis rule the day here, you can sip house-infused vodkas or single malts while holding court at any of our ample tables or quietly sitting on a plush leather stool. Our favourite – the Sangria Martini. TY is an intimate lounge with outstanding style and a cozy living room feel. When you enter you’re greeted by a stunning fireplace and I.M. Pei-designed interiors. Nestle in one of the oversized chairs and savour a nice day of people watching or a night of fine conversation. Along with its sophisticated hors d’oeuvres menu, TY offers a premium selection of aperitifs, spirits and champagne, making it the ideal setting for light fare, day and night in Midtown Manhattan. 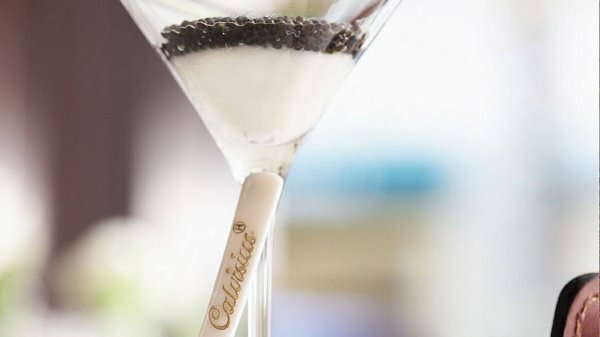 Savour a bit of exquisite caviar in a setting equally as splendid. The Calvisius Caviar Lounge—with its cozy atmosphere and 1930’s art deco elegance—makes it home at Four Seasons Hotel New York. The only lounge of its kind in the world, it prepares small dishes with two types of Italian roe—white sturgeon and Oscietra, along with a fine selection of champagne, Italian sparkling wine and superior vodkas. Four Seasons In-Room Dining is a fine-dining experience within the comfort and convenience of your guest room or suite. Choose from an extensive menu – day or night – that is ideal for time-zone-hopping travellers, impromptu meetings or for quiet, private dining. Try one of our favourites – Classic Roast Turkey Club, Applewood-Smoked Bacon and Sourdough Bread.